At my home we are fond of Green Peas, called Matar in Hindi and in Marathi and I make dishes using them quite often. Elsewhere in this blog, you will find recipes for dishes using green peas such as Green Peas Masala, Spinach & Green Peas Rice, and Paneer Peas Masala. Today's recipe is from Maharashtrian cuisine and is called Matar chi Usal. 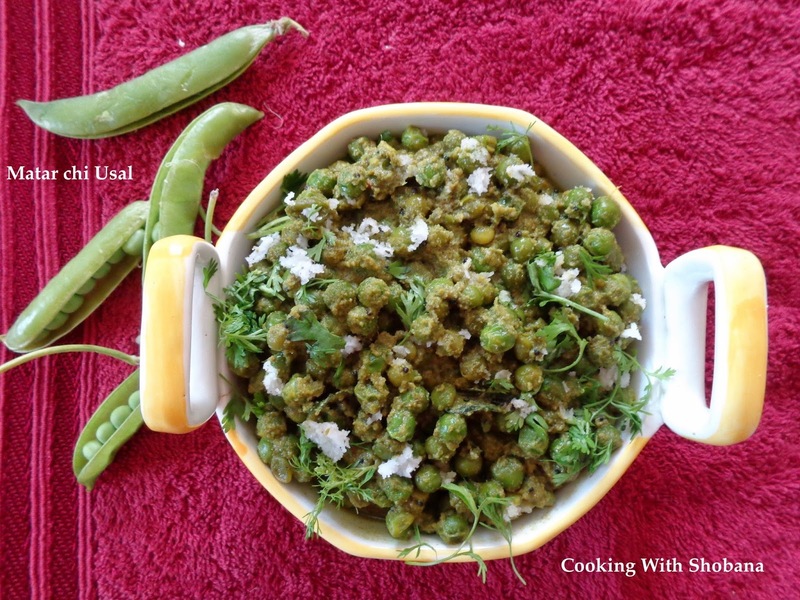 This is adapted from Green Peas Usal by Dasanna in her popular blog, Veg Recipes of India. We had this with rotis and found it to be very tasty. You can use fresh green peas during the season or frozen peas if they are not available. If you don't have Goda Masala which is normally used in Maharashtrian cuisine, you can substitute this with 1/2 tsp of Garam Masala. In a mixer jar, grind together coconut gratings, green chillies, ginger, coriander leaves, and cumin seeds to a smooth paste adding 1/4 cup of water. Keep aside. Add the green peas and cook covered on medium heat adding about 1/4 cup of water stirring from time to time till the peas are almost done. You may add a little more water if required to cook the green peas. Serve hot with rotis, chapatis etc.